I was translating a news story. And I came across an interesting idiom in that article. 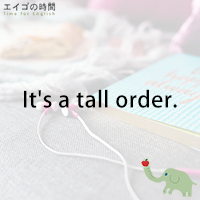 It’s a tall order. Have you ever heard of the expression? When you say something is a tall order, you mean it’ll be hard to do or difficult to achieve. It might even be impossible to accomplish. For example, let’s say, if I worked out, I could lose five pounds in one month, definitely. Ten pounds? Maybe. Twenty pounds? Forget it. It’s a tall order. I’ll give you another example, which in fact is offered by EnglishClub.com. I like that example, so let me share it with you. Getting kids to read 600-page books is a tall order these days, but the writer of the Harry Potter books has managed to do it. Good, huh? 1. It will be fun to do it. 2. It will be easy to do it. 3. It will be difficult to do it. Getting kids to read 600-page books is a tall order these days, but the writer of the Harry Potter books has managed to do it.